Anna D'Angeri (Angermayer de Redenburg) (14 April 1853 – 14 December 1907) was an Austrian-born opera singer, who made Italy her adopted country and Italianized her surname. 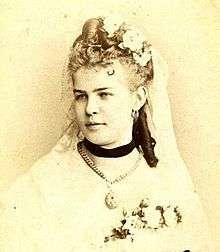 She had a brief (1873–1881) but eminent career singing leading soprano roles at the Vienna Hofoper and La Scala, Milan. Particularly admired by Verdi, she sang the role of Amelia in the premiere of the revised version of his Simon Boccanegra. She also sang the roles of Venus and Ortrud in the London premiere of Wagner's Lohengrin and created the roles of Jefte in Ponchielli's Il figliuol prodigo and Maria in Gomes's Maria Tudor. ↑ Vallini, Valerio (1986). "D'Angeri, Anna". Dizionario Biografico degli Italiani, Vol. 32. Treccani. Online version retrieved 18 May 2015 (Italian). This article is issued from Wikipedia - version of the 12/20/2015. The text is available under the Creative Commons Attribution/Share Alike but additional terms may apply for the media files.